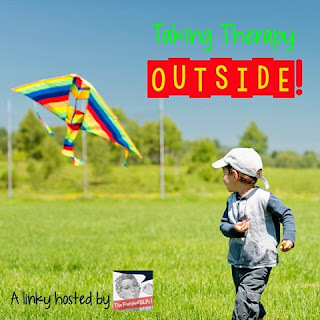 This week, The Frenzied SLPs are bringing you ideas of how to take therapy outside. This is something that I love to do when the weather is nice. The school social worker at my school and I have done some fun things with our ASD groups. One of the outside activities was a scavenger hunt. This is an activity that we have done for a few years now. I posted about it a while ago, but thought I would share again. First, we made a scavenger hunt schedule for each student. 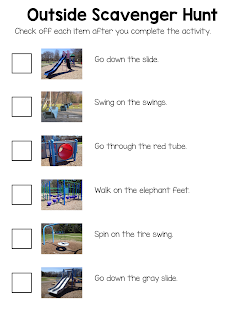 They needed to find each piece of playground equipment on the playground and check it off their list. We encouraged the students to play with each other and wait for friends at the end of each piece of equipment. After the students completed the scavenger hunt, we went back inside and worked on our conversation skills. 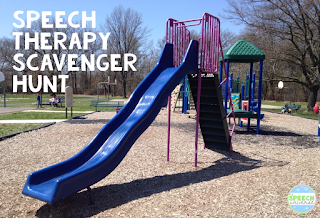 The students asked each other, "What was your favorite piece of playground equipment?" This is a skill we have been focusing on for months now, and the students are getting MUCH better at directing questions to each other and orienting themselves toward each other. They are even getting better and asking and answering the questions without visual supports! This year we are going to take some of our general education peers out with us to do this activity. We have two volunteer students for four of our groups. This will be a great way to get our students with ASD to engage with their peers in a different way. I'm looking forward to the conversation piece this year too, as our students have progressed to asking additional questions about topics and making comments. Looking forward to the nice weather very soon!!! How fun, Jen!! I LOVE your visual checklist and creativity!! I really love how you used photos in your checklist. What a fun activity! I love scavenger hunts! Great idea for therapy! Love the checklist! Great ideas! 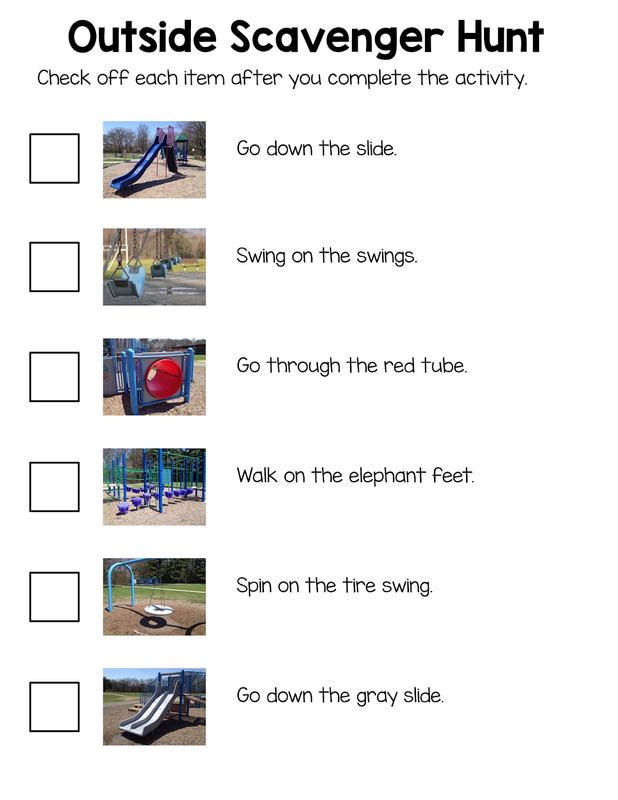 What a great idea to use the photos and playground equipment to structure the conversation! Wonderful way to develop language skills and develop peer relationships! Love the visual! Wow, what a great way to work on skills needed everyday at recess! Love this idea for social skills groups!